In 1942 The Musical Times reported a ‘grave loss’, referring to Walter Leigh’s tragically early death - killed in action whilst serving in a tank regiment near Tobruk, just before his thirty-seventh birthday. Though during his lifetime he was more than once compared to Sir Arthur Sullivan, from a contemporary standpoint an equally pertinent analogy could be drawn with a composer from a later generation, Sir Richard Rodney Bennett. Both men approached film music and ‘light music’ with the same seriousness of purpose and invested it with the same impeccable craftsmanship they brought to their concert pieces. 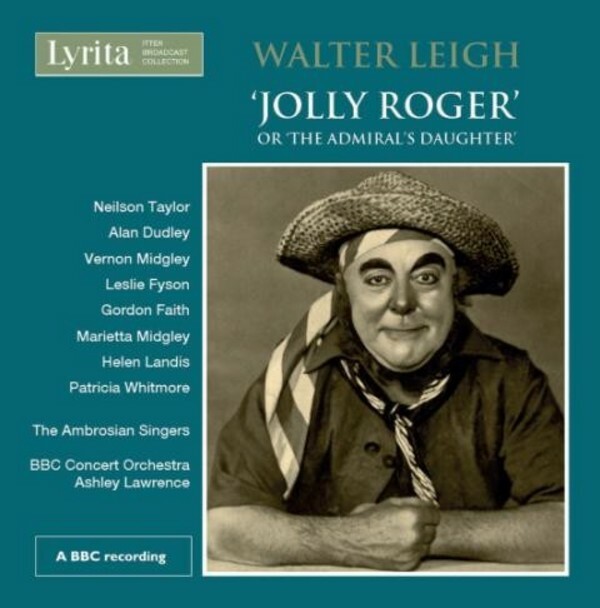 A comic opera in three acts, Jolly Roger or ‘The Admiral’s Daughter’ opened at the Opera House, Manchester on 13 February 1933. Running for over six months, it transferred to the Savoy Theatre, London on 1 March 1933 and moved from there to the Lyceum Theatre on 5 June 1933, accruing a total of 199 performances. Jolly Roger enjoyed a critical success from the outset. The Morning Post referred to the ‘delicious grace’ of Leigh’s music, whilst another contemporary review demonstrates that Leigh was highly prized in his own lifetime for his gifts as a melodist: ‘Here, at last, is an English composer who can write light music with style and finish. Yes, a second Sullivan is not too high praise’. It is likely that the plaudit Leigh himself would have prized most highly came from Constant Lambert, who commented, ‘I know of no music that is more enjoyable both intrinsically and satirically than the music of The Pride of the Regiment and the recently produced Jolly Roger. One has the rare and enjoyable sensation of both having one’s cake and eating it’. The BBC radio broadcast presented here was first aired on Radio 3 on 21 December 1972. Heard again, more than forty years later, its seagulls, splashes of water and pirate accents make it something of a period piece in its own right. Nonetheless, it is the deftness and allure of Leigh’s music that makes the strongest impression.